Join with your friends, load up gadgets and weapons, and get ready. 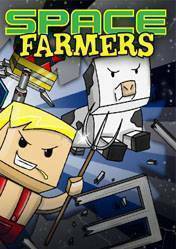 Farmers Space is an action game, meant to be played co-op and one of the most fun and entertaining to date. Our characters are trapped in an alien space station and are forced to share their secrets on agriculture. Our mission is evacuate this space station and kill the evil aliens. Hordes of hungry robots, gadgets and weapons, puzzles, pigs and more awaits you in this action-adventure title. There are no comments yet about Space Farmers . You can be the first one!